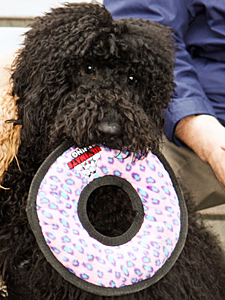 Our thanks to everyone who participated in our I Love NYC Pets Month Photo Contest in February! Your photos of your amazing pets were awesome, and we enjoyed viewing them and sharing them with our followers on Facebook. They voted on their favorites, and we are delighted to acknowledge the winners they chose. 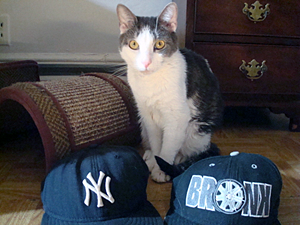 Munchkin is a Bronx native, and she’s a true New York Yankees fan. Her mom was rescued from the streets, but she and her three kittens survived, and today they have all been adopted into happy homes. 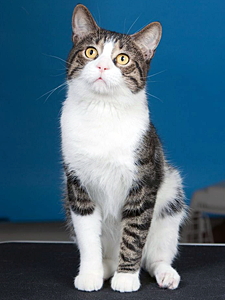 Munchkin was the runt of the litter (hence the name), and she is having a great life with her new family. Paz always has a good hair day in NYC. Paz is a two-year-old registered Pet Partners Therapy Dog who volunteers at the NYC Family Justice Center in Brooklyn (BKFJC), where his mom works. Paz’s muppet-like appearance and gentle disposition bring endless joy to the children at the BKFJC, most of whom have witnessed domestic violence. Both the staff and kids at BKFJC love it when Paz visits — he’s a good listener and gives wonderful, sloppy kisses. Paz loves living and working in NYC, where his hair always looks good and people are so nice. Sam is New York to a tee! Rescued by NYC firefighters, Sam has the attitude, strength, and resilience New Yorkers are known for. Plus, she has a heart of gold. 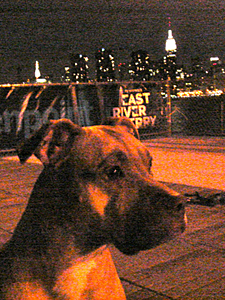 This Brooklyn Pitty is an avid connoisseur of NYC’s diversity — from pierogies to pizza to Chinese takeout (steamed, with no sauce, of course!). She has a quick New York step and loves to power walk through crowds. When she’s not strolling through the streets of Greenpoint, saying “hi” to every fluffy little dog she sees, she’s running laps in her backyard or playing with her fellow rescue buddies. But here’s what makes her a true New Yorker: no matter where she goes with her family, be it the Catskills or cross-country, somehow she always knows when she crosses that bridge or exits that tunnel into Manhattan. She wakes up, pops her head out the window, and takes in the sights and sounds of her city. Chaussettes was brought to the Animal Care & Control of NYC (AC&C) shelter when her owner died two years ago, and Anjellicle Cats Rescue took her in. Missy adopted her and has given her a wonderful life, including plenty of snuggles. 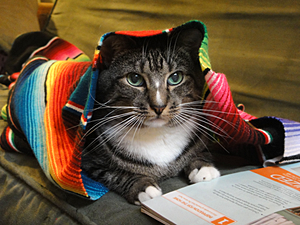 Chaussettes is an avid shopper and never misses her biweekly French manicure appointment. She prides herself on her unique style, and for that she always receives the hottest invitations for Fashion Week. On a lazy day, Chaussettes loves to perch at the window overlooking Columbus Circle and gaze at the birds in Central Park. Kristen adopted Colin from AC&C in January. His leg was fractured, but today he is walking tall, and, in fact, has contracts for modeling gigs! With a bright future ahead, Colin is the picture of good health. According to Kristen, he is her dad’s BFF, and he’s just a doll!